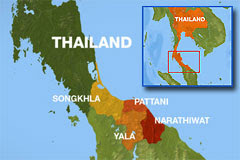 At least 10 people have been killed and 19 injured after armed men opened fire on a mosque in southern Thailand. Men armed with assault rifles entered the mosque in the Cho-ai-rong district of Narathiwat province during evening prayers on Monday and opened fire, the army and police said. "They opened fire indiscriminately at about 50 worshippers inside the mosque," a police official said on condition of anonymity. The dead included the local imam, he said. The attack in the Muslim-majority south comes amid a recent spike in violence in a five-year insurgency that has left at least 3,700 people dead. Police have said at least five gunmen carried out the attack, one of the deadliest single incidents since the insurgency began in 2004.